This is a copy of a short and very rare booklet by the son of Henry Leathes, which was published around 1870-80. It consists of a collection of seven letters written around 1859-63 between Henry Mussenden Leathes and Alexander Cavalie Mercer, both of who served with G Troop, in the very twilight of their years, reminiscing over their trials at the Battle of Waterloo. I became aware of this little volume through the kind offices of Philip Haythornthwaite, who kindly passed a copy to me having seen a reference to it in his book Waterloo Men. 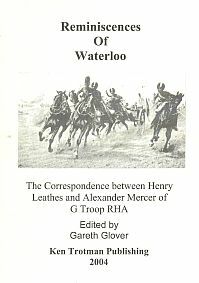 I eventually published an article entitled Mercer’s Troop at Waterloo in the Journal of the Association of Friends of the Waterloo Committee in April 2000, with the information I had gleaned to date from the official records of G Troop held at the Public Record Office. The exploits of G Troop Royal Horse Artillery at Waterloo have become part of the folklore of that great battle; their deeds so ably described by the pen of General Mercer in his journal first published in 1870. Mercer also wrote a number of letters to William Siborne, giving further details of his experiences at Waterloo, which were later published by his son Herbert Siborne in Waterloo Letters. Second Captain Alexander Cavalie Mercer, as he was at Waterloo, vividly describes with his able pen the chaos of G Troops march through Belgium and their exploits at Waterloo. However, Mercer studiously avoids giving anything away in his book regarding his feelings after this campaign. Reading between the lines, facts such as his refusal to name his second in command (Newland) throughout his book; his implied criticism of his senior officers and his difficult relationship with Lieutenant William Ingilby, show that he was not necessarily the easiest person to get along with. Furthermore, he clearly felt aggrieved that his exploits did not earn him more than command of his own troop after Waterloo (he succeeded to the command of D Troop as Captain Beane had been killed) and he blamed his seniors for this. Lieutenant Henry Leathes had been a supernumerary officer serving with G Troop in Belgium. His replies to Mercer are more measured and portray someone who still retains a clear memory of those fateful days. His opinion that Mercer had exaggerated their losses is borne out by the Muster Rolls held in the PRO, for example. These letters throw a very interesting side light on the subject of G Troop, it shows Mercer’s irritation even after all those years; and it is clear that he had become a very bitter old man.